Hello everyone, I'm going to cook a whole chicken on the ole BGE today. I have been looking thru the forums and keep reading about Spatchcock cooking. I must be missing the explanation of what the technique is because I can't find it. Can someone one help this poor old blind cook? Thanks. Search you tube and you will hit on a million vids. Some there are from the BGE community and are very detailed. This is for turkey. I like smaller chickens. Less than an hour cook. Spatchcocked Turkey (you cut out the backbone and cook opened) I like a 11/12 lb bird. If I need lots of turkey I just cook a couple ( 1 & 1/2 hr cook app) Or, just add a package of legs extra. I do not brine the turkey. If time I like to leave uncovered in the fridge overnight (no problem if no time) I cook "direct" @ 400 on a raised grill "skin side up" and never turn over. I will use a coffee rub (see below) Use what you like. NOTE PLEASE (A LOT OF SMOKE IS NOT YOU FRIEND) I use about a single handfull of mixed chips: Cherry & Pecan. Cook to temp (not time) breast @ 160 and thigh @ 180 Please let set for 20 to 30 mins to rest before cutting. Coffee Rub (turkey, chicken, beef & pork) Equal part: Instant Expresso Ground coffee Equal part: Brown Sugar ½ part: Black Pepper ½ part: Kosher Salt ½ part: Garlic Powder ¾ part: Ancho Chili Powder Don't worry on exact, just close on measurement. I used to use turbinado sugar but we like with brown better. This is pulled from MollyShark, Hungry Man, & Richard In Fl then tweaked. I find the ancho chili powder is far less expensive in the bulk spice area than the bottled area ( have used both light or dark version). I make it starting with a half cup Instant Expresso Ground coffee and work from there as it seems to store well if sealed. I cook over a setter, indirect set-up, 400. It can be cooked raised direct at 350-400, but the indirect cook is a little more foolproof for the first attempt, IMHO. @Oilpony-I would cook til the breast meat is around 160*F and the thighs 180+*F. I let the chix warm for around 30-45 mins then put a small bag of ice on the breasts for around 20 mins just before tossing on the BGE. Chills the breasts enough to get to the finish-line with each piece at around the target temp. Give it a shot-if it doesn't work thne try something esle-the beauty of the BGE-almost any road will get you there. My cooks run around 40-55 mins raised grid direct at about 350*F +/- on the dome. 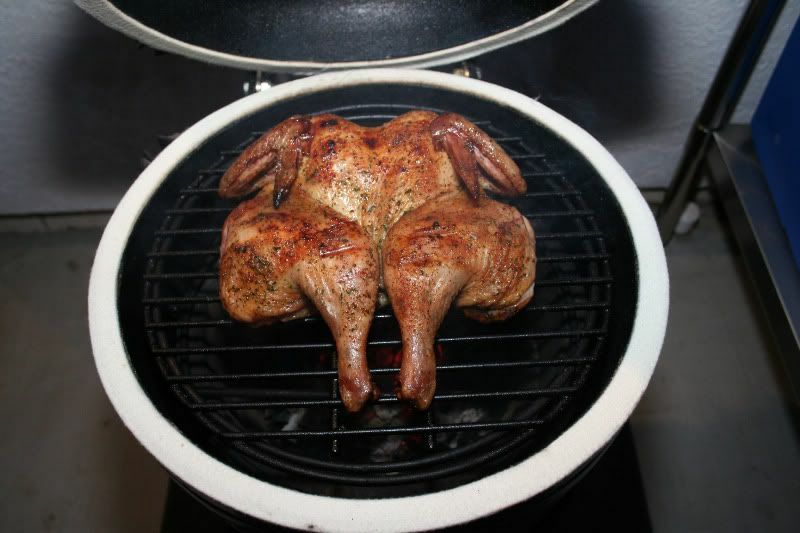 Agree with @lousubcap, also put the bird on with the legs near the hinge, it is usually slightly hotter there. Lately, I have parted the bird, so the legs/thigh go on 5 minuted before the breasts and 10 minuted before the wings. Easier to cook legs to temps lousubcap notes. Agree with @Skiddymarker, you can also take spatchcock a step further and basically quarter the chicken. Removing the backbone gives it better access to the heat and opens up the cavity to better receive the smoke. Just watch the heat don't let it get too hot it will burn quick. Done that before. Thanks all for the guidance. I will let you know and post photos how it goes. How did you take the temp and with what?